I am excited to serve as the principal of Valley Christian! I have had the opportunity to meet with staff and board members as well as some parents this past September and October 2017 during my visit. What I saw in the staff and the community excited me about becoming involved with Valley Christian School! As a introduction, I wanted to give you some information about our family. I am from Brandon, Manitoba, which is where my parents came as Dutch immigrants after WWII. I graduated with a Bachelors of Religious Education from Reformed Bible College (now Kuyper College) and a Masters of Arts in Teaching from Calvin College (both in Grand Rapids, Michigan). My wife, Mary Lou (who is a “California girl”), and I met at Reformed Bible College. We are blessed with three sons and a daughter. I began my teaching career in New Mexico working for Rehoboth Christian School as a teacher for grades 4–6 at a small Christian school on the Navajo Reservation in Crownpoint, New Mexico. Our two oldest boys were born in New Mexico and although we thoroughly enjoyed our four years in Crownpoint, I felt the desire to move back to Canada. I was very grateful for the opportunity to become the principal of Vancouver Christian School (also VCS!). After 17 years at VCS I felt it was time to let others have the opportunity for leadership. I took the position as Superintendent at Rehoboth Christian School (in Gallup, New Mexico) for four years and then as principal of an elementary school in Gallup for seven years. I had also served as Director of Personnel for the same school district for five years. During our intervening years here in New Mexico three of our four children have ended up in BC and we now have four granddaughters living in Maple Ridge with our son and daughter-in-law. The call to come back to BC has been strong and this opportunity is seen as a gift from God. 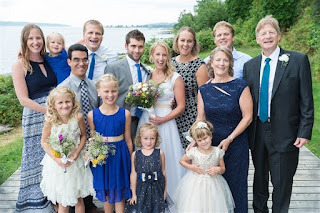 Three of our four children (and a son-in-law and daughter-in-law) are also in education, two here in BC and a son in Michigan where both he and his wife teach at Fremont Christian School. They have three daughters so we are blessed with seven granddaughters! It is my hope and prayer that we are able to serve the VCS community for many years to come. I invite you to come and check out Valley Christian School if you have the chance! We have a ready smile for everyone and we would love to show you what a little treasure we have here at Valley Christian School!